(Ver 1.2) Today is Part 14 in a series of advanced lessons on Understanding Bible Faith. If you have not been reading this series from the beginning I would recommend that you go back and start with “Part 1”. Faith is by far one of the most significant subjects found in the Bible for every Christian to know. This subject has far reaching applications that crosses into everything else found in the Bible. The Bible says that without faith it is impossible to please God. The Bible says that whatever is not of faith is sin. Without faith it is impossible to be saved. Without faith you will remain where you are today and fail to achieve what God has called you to do. These are radical concepts that few Christians attempt to understand and they have therefore, failed to recognize why they are in the situations that have arisen in their lives. God many times gets blamed in error for these conditions of mankind. But, it is far more likely that it was the people’s own ignorance of the subject of faith that has caused them to be facing what they think that they are unable to overcome. What have we learned from this series of Bible lessons on faith? We should have learned that anything that happened to anyone in the Bible that was ever positive occurred only because someone had faith in God and His Word. Even in the majority of the cases observed in the Gospels, Jesus only acknowledged a person’s faith as being the key factor for them being saved, healed or delivered. At no time did Jesus take credit and say that it was His power alone that delivered anyone. This is why this subject is so critical to learn about right now. What applies to the people in the Bible applies directly to you and me today. 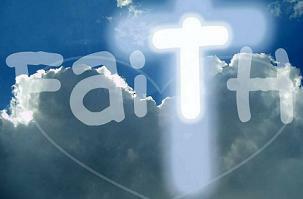 Faith is the human factor that causes God’s power to be made manifest in the natural world. This could be the Power of God for spiritual salvation, physical healing, emotional restoration, marital reconciliation, child relationship and development or financial blessings. God cares about every area in your life, but God is not going to get involved just because He can or just because you need Him to. God will however, respond to your faith and move heaven and earth to get you the answer when you learn to do your part and believe. This is an interesting concept that is easily overlooked by Christians? This word conveys personal responsibility to do something. This something requires individual action in order to be made effective. There are many things that come to my mind when reading this definition. If someone takes something that was not given to them, this is called theft or stealing. But, since we are talking about God’s gifts that have been given through His promised Word we are going to have to figure out how to reach into the spiritual realm to take what we cannot see or touch with our physical senses. Think of it this way, what if God has given to us in the spiritual realm, but no one has come from the natural realm to take what He has offered to us all freely? Is God going to come into the natural realm and force you to receive (take) it? That would certainly change the definition of receive, wouldn’t it? That is the religious idea of election or predestination and that is not in the Bible. God will never force His will or His gift of salvation upon anyone who does not take it freely. People in the natural realm are always required to take by Faith what God has given freely by Grace in the spiritual realm. Think with me in terms of natural Israel as being our example. They sat in the wilderness dying because they did not want to go into the Promised Land to take by faith what God had freely given to them by Grace. The Promised Land represents the spiritual dimension of your faith fight and obtaining God’s blessings. The wilderness represented the natural realm where if you remained you do without God’s blessings. Do you understand the analogy that God has given to us from this very clear Bible example? Jesus asks the blind man what do you want from me and the blind man demonstrates his faith by his actions and his spoken words. The answer given to Jesus question was “I want to receive my sight”. Why didn’t the blind man just ask for Jesus to give him his sight? Wow, that is a really great question. Sight is definitely what the blind man was after from Jesus, yes? Did you know that it matters what you ask for and how you answer when God comes to you? If the blind man’s words did not matter then why did Jesus even ask the question? Jesus is obviously well aware of the situation and the need and yet the man is not yet healed. What is Jesus waiting for? The problem was standing right in front of Jesus and Jesus could have just reached out and said “Be Healed” if it was all up to the power of God. Please think when you read the Bible. Jesus never does anything like you would do normally. If you were God standing before a blind man you would have probably just said “Your healed” and kept walking. But, Jesus stops and asks this man a question and that has meaning and his answer must matter. Everything that Jesus did was on purpose. I personally believe that it was only because of the blind man’s great answer that allows Jesus to continue. Can Jesus just heal everyone in the Gospels? Unfortunately, you do not find that is true if you observe what it really says. We learned from the woman with the issue of blood that she was the only one that got healed in a massive crowd of people that were all trying to touch Jesus. Jesus turned and looked at her and said your faith has saved you. Getting back to the blind man’s answer, why does he ask to receive his sight from Jesus? Do you understand that these words put the responsibility upon the blind man to receive and not Jesus to give? Do you understand the difference? That is a very new radical approach to take with an omnipotent God that is always capable of giving to us anything. God is teaching you that the way you think and speak is going to matter if you want to get your answer from Him. Jesus clearly associates the blind man’s faith to be the determining factor for him being able to receive his sight and it was also his “receiving” that permitted the anointed power of God on Jesus to flow and to manifest in the natural realm. You may recall that when the woman with the issue of blood touched Jesus, immediately Jesus felt virtue (power) flow from Him. Jesus stops and turns to see who accessed this power to flow and then tells the woman your faith has saved you. I always find it very interesting what Jesus says to people. Jesus does not say I have healed you even though it was clearly the power that He was anointed with that did the work in everyone. To the blind man, Jesus said “take your sight, your faith has saved you” and this caused power to be transferred from the spiritual dimension into the physical dimension. I may have implied this before, but I want to reemphasize the fact that faith is a spiritual force that you possess and not a natural feeling that you can work or sense and we will talk about that more in second. Clearly in Luke 18:42, Jesus again places the emphasis on the man’s taking with his faith and not upon God’s giving of the power. I like the term “immediately”. This man is instantly healed by God and received what he requested without delay. However, this is not the only blind man healed by Jesus in the Bible. Why does God not treat every similar problem the exact same way? Did you ever notice that? There are several different blind men healed by Jesus in the Gospels and they are all different. It is actually a great lesson to go and read them all to determine the differences, but I will not do that for them all to limit the size of this lesson. I technically believe that God does treat every identical problem the same, but that it is the human contribution or factor that causes the variableness to occur. It is only because every person does not have the same level of faith that things appear different in the natural realm. For example, there is a blind man found in John chapter 9. This man encounters Jesus in a much different setting. If you do not recall this story please stop now and go read John 9 and then continue with this lesson so that we can compare the two similar problems and the healing examples. In John 9, the disciples point the blind man out to Jesus and ask Him a question about who sinned to cause his blindness. Let’s skip the answer to concentrate on what Jesus did different for the blind man and then let’s compare what this blind man did that was different to the blind man in Luke. In John 9, Jesus spits on the ground and makes mud and puts it on the man’s eyes and then tells him to go and wash it off. Why didn’t Jesus do this in Luke 18? The blind man in John 9 goes and does what Jesus asked him to do and comes back seeing. Why didn’t Jesus just look at the blind man in John 9 and say “Receive your sight your faith has saved you” like he did in Luke 18? Both are clear miracles of receiving sight, but they are completely different examples of the variable of human faith required to receive. It is clear to me that the blind man in John 9 had no faith at least at first. Let’s back up in the story of the blind man in Luke 18 to learn a few new things that I did not include to compare the differences. Who is the blind man in Luke calling for? He had just heard that Jesus of Nazareth was passing by, but he calls out for Jesus the Son of David. This was a covenant term of recognition or a covenant Title of respect and honor. Clearly this blind man understood more than many that were in the Jewish temple. The fact that the blind man calls Him the Son of David reflects that he knew who He was. The Messiah was prophesied to come from the seed of David. According to prophecy David’s son would forever sit on the throne of His father David. These are natural descriptions as well as spiritual terms being related. Take notice, who the blind man is calling out for. Could it be these covenant words that got Jesus attention to stop and not to just pass him by? Also note the man’s acknowledgment of God’s mercy. Love, mercy and compassion are all spiritual partners of God’s Grace. You can call them synonymous terms or you can see them as related intertwined subjects like a divine chord of character. Grace, mercy, compassion and love caused God to give to the world what they did not deserve. Nevertheless the blind man directly sought for Jesus and this must have been based upon him hearing His Word in order to already have faith when Jesus had not said anything to him up until this point. Therefore the man had faith and chose to do something to receive. Doing nothing would have resulted in Jesus passing by. Doing nothing would have resulted in him not receiving. The blind man could have had faith after hearing, but kept silent and not activated it and he would have done without. Why is Luke 18 so much different than John 9? Both are blind men. The blind man in John 9 never calls out for Jesus to do anything. The blind man in John 9 does not ask for mercy, does not call Jesus the son of David, does not ask to receive anything and therefore Jesus has do some things differently because this man had no faith at this time. The John 9 blind man either does not know who Jesus is or has just never heard of him before now as being the anointed one sent from God. Luke 18 clearly is radically different. The blind mind initiates the contact after hearing the crowd passing. The John 9 blind man is passive and the Luke 18 blind man is totally aggressive taking the initiative. The blind man in John 9, Jesus initiates the conversation. The blind man in Luke 18 even the people can’t shut him up. 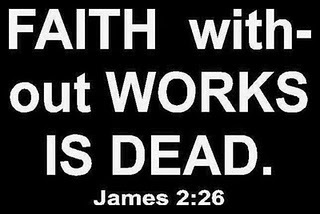 One man has faith and corresponding works and the other man has neither at first. Let me introduce another complex factor that I have addressed only in passing. There is another faith factor or partner given to us in James that is applicable to what is occurring both in Luke and in John. Please allow me to take a side trip into teaching you about faith and works and how they are displayed in each Bible story from Luke 18 and John 9. Roman’s 10:9 demonstrates how faith and works go together and tells us that we must first believe that Jesus was raised from the dead. The only way you are going to believe this is if someone comes and tells you about Him first. How does faith come? According to the Bible faith comes by hearing the Word of God, therefore believing comes by you first hearing. Then Roman’s 10:9 tells you that if you confess Him as Lord with your mouth then you are saved. This is the external works part of the internal spiritual faith belief. This verse is actually given to us in reverse order of occurrence and it does not directly mention the preaching part of the process, but yet everything can be confirmed by reading the next verse. Notice that true Bible believing only occurs in the heart of men and women on the earth in Romans 10:10. It is with the heart (spirit) that the Bible says that people believe anything. What we discover is that there are two realms to the completed process of salvation. The natural realm requires your works of confession while the spiritual realm requires your heartfelt beliefs to be established on God’s Words given to us by His Grace. All of this is dependent upon you first hearing the truth of the Gospel and then receiving it like we saw in the story of the blind man in Luke 18 or the woman with the issue of blood In Mark 5. Why did the blind man not ask Jesus to give him sight? Why did the blind man only ask to receive? This is the most important part of Bible faith. God had already given Jesus and the Messiah was present in the flesh standing right before this blind man. The blind man does not need to ask for Him to come and heal because God has already come and He was already anointed by God with healing power (Acts 10:38). The Bible said in Psalms 107:20 “God sent his word and healed them and delivered them from their destructions”. Do you suppose the man understood what the Bible said? Jesus the Word of God made flesh was given and present. God says in Psalms 107:20 that this sent Word “healed” them, as in past tense, done. Why do you need to ask for anything that was already done? That is the problem of most people’s prayer in the world today. They pray for salvation for a friend and salvation was given already and the friend now just needs to receive what God has given. Pray for your friend to receive, pray for God to send laborers across their path to preach but do not pray for God to save them. God will simply say to you I have done that if you were truly listening when you read my word you would have seen where I told you that I saved them. You can find this truth in many verses but one of these is where God says that we have been given the ministry of “reconciliation”. This is a radical concept and this verse has some great information within it. The statement that God was in Christ informs us that Jesus was much more than just an ordinary man. He was God in the flesh and why did God come in the flesh? This verse says that God came to reconcile us (the world) to Himself. The world was everyone that was unsaved, an all inclusive scope of reality. This is again past tense terminology given to us as the completed action of God. These are specified things that God has already given and already accomplished. This verse ends with a message of direction for us today. We are to go and tell everyone what God has done. This is called the ministry of reconciliation. Reconciliation is the great exchange. 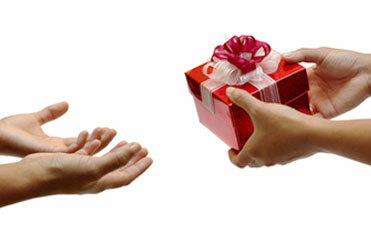 God has given to us His life and in exchange we are to receive this eternal life by giving to Him our lives. What God has already given to us in the spiritual realm, we now must receive in the physical realm through our faith and works. Here is a man that is blind, he hears a commotion and asks what is happening and people tell him about Jesus of Nazareth passing by. As the man calls out for the Son of David and for mercy others around him rebuked him to stay silent. What spiritual application can we learn from this new information that applies to us today? We learn that not everyone in the world is on your side and is willing to help you get your answer. We learn about the concept of the opposing forces of evil that will try to stop you from receiving. In other lessons I talked about these being like faith giants in the spiritual battle of your faith. While you are seeking for God’s mercy, you will encounter a spiritual force of opposition that will attempt to shut you up and stop you. Do not think that all of the things of God will be so easy to access? Do you think that you have no enemies and that God has no enemies? Where do you find that in the Bible? Do not assume everyone is on your side. Truly the opposition in Luke 18 came from ignorant people who knew not the heart of God to save this blind man. These people understood little to nothing of how God worked and why. These are examples of people that you will run into everywhere still today, on the internet, in your church, in your Christian book store and at your work or in your family. These people will discourage you from seeking to be healed, saved and delivered. Nowhere in the Bible does it say that you will not be persecuted for doing the right things and for seeking God’s help. What made this blind man in Luke 18 ignore all of his critics and continue to shout louder for the Son of David’s mercy? It is called the determination factor. If you are determined to receive from God then you will receive from God no matter what comes against you to stop you. Determination can mean when it looks like it is not working you remain confident that it is working. Determination can mean that when someone tells you the Bible is full of lies and errors that you just ignore them. The blind man in Luke 18 could have given up and given in to the opposition and then he would have remained blind. The blind man in Luke 18 could have listened to fools and stayed blind. If the woman with the issue of blood in Mark 5 had not been determined to fight through the large crowd of people to touch Jesus then she would have not been healed either. She showed her determination by not giving up or quitting despite not feeling well and all of the people that were in her way. The blind man in John 9 could have given up on the way to the pool. He was still blind the whole way there. Jesus didn’t go with him and encourage him the whole trip to make sure he did what he was told either. Do you think that it was easy for him to get there? Have you ever been blind? I think it was not easy for him to do anything that Jesus said to do. You are going to have to make a conscious decision to become determined after you learn about faith. You will have many enemies both spiritually and naturally that will counter your beliefs to get you to fail. Your Will/Desire to Get the Answer. Your Aggressive Actions to Participate in the Process. Your Understanding of the Word Heard. Your View of the Importance of the Word of God Heard. Your Belief in His Anointing Power. Your Belief in the Truth of the Word of God. Your Confidence Level in God’s Ability to do what He has Promised. Your Confidence Level in God’s Willingness to do what He has Promised to do. Your Overall Trust in God. Your Continued Determination Level Despite Major Opposition. Your Reaction to the Opposition. You should be able to find these faith qualities demonstrated in the life examples of everyone to some extent. Not everyone of them is obviously stated in every story, but yet they play a role in them receiving from God their answer to their problem. Today’s lesson was primarily about Faith Receives in the natural realm what God Grace has given to us in the Spiritual Realm. I then taught you that this was a combined effort of both the natural and the spiritual realms of man working in harmony. The human spiritual realm is where we believe and the natural physical realm is where we do the corresponding works. The realm of the human soul also plays a role in my list of factors but I have never spoken of this realm directly before just now. The soul realm of man is where our mind is, where our will originates and where our emotions play major factors into the faith fight. I talked about your will in other lessons being a factor to receiving. Today I talked about your determination being a factor and again this comes from your soul or your will. Your emotions will play a factor and cause you to want to give up. These are some of the very complex factors involved in Bible faith. We could probably add many more to the list and potentially we may do that in future lessons on this subject. I hope and pray that you learned something today about faith that will help you in your relationship with God. Until next time, may God bless you and keep you as you walk by faith. God Bless. If you would like to continue reading in this series on Bible Faith please go to “Part 15“. Posted on October 28, 2011, in Bible Study, Faith, Understanding and tagged Bible, Christianity, Church, Faith, God, Jesus, Knowledge, Religion, Truth, understanding. Bookmark the permalink. 2 Comments. Ron, you are really doing a great job. The joy of the Lord is your strength. Keep the flame burning! Thank you for your kindness and your blessings. I appreciate you very much. I pray that you have a blessed year as you spread the Gospel of Jesus Christ.